Warning: this is a “concept” disc – but I don’t find the concept very convincing, nor very convincingly carried out. In the lengthy essay contained in the liner notes, composer Paul Reale opposes the dominant (in his view) 20th century music trend that, according to him, has “confused art with research” and built upon a rejection of the past “with disastrous results”, to another, more subterranean trend (in which Reale includes himself, of course) which supposedly builds upon that very past. And rather than serial techniques versus tonality, Reale, when he talks of the “negation of the traditional use of musical structural elements”, appears to refer to a basic grammar of tension and repose that makes up the musical phrase in the western tradition, a view which enables him to categorize minimalist/repetitive music as part of the “deconstructionist” approach. I find the concept rather dubious. Few composers have been steeped in the past more than Schoenberg, the inventor of serial music, and I doubt that Boulez, whom Reale gives as the champion and epitome of the approach he so scorns, would accept the view that he rejects the past and the grammar of tension and repose. On the other hand Reale’s equation of this supposed rejection of traditional structures with the estrangement of the public is belied by his inclusion of repetitive music therein. It appears, on the contrary, that the style represented by John Adams has been a major claptrap of these last twenty years. And where does Charles Ives fit in Reale’s tableau? Ives didn’t reject the past – he simply provocatively and jestfully dislocated it – and it certainly doesn’t make his piano sonatas, 2nd string quartet or fourth symphony any easier on the listener. As for Ruggles – this other maverick figure of American 20th century music – his four short Evocations don’t sound to me less estranged from western tradition nor less demanding than Schoenberg’s Klavierstücke op. 11 or Webern’s variations op. 27, with which they share some similarities: sinuous and overbearing melodic contours stretching the sense of tonality, build-up of sound from pent-up menace to stark and massive blocks, and the use of the piano’s overtones produced by notes struck next to a silently depressed chord, a device first used I believe by Schoenberg in his first Klavierstück. 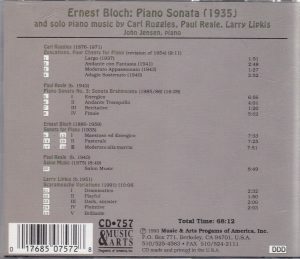 So the lecture seems to me like an attempt for Reale to nudge himself in the limelight deserved by these two original figures of early 20th century music: Carl Ruggles and Ernest Bloch (the words “Ernest Bloch Piano Sonata (1935)” appear in huge caps on the disc’s cover, as if the other works were mere fillers; there is a companion disc, Music & Arts CD-738, barcode 017685073823, in which two more Reale sonatas are coupled with Copland’s Piano Fantasy and Four Piano Blues, and with a title that more faithfully describes the content: “Piano Music by Aaron Copland and Paul Reale”). And it would be all fine, if Reale’s sonata didn’t show with a vengeance that it is not enough to pay homage to the past (and particularly to Brahms, as the piece is subtitled “sonata Brahmsiana”) to produce music that is original, interesting and truly memorable; I would suggest that this is because it relies too much on a melody-based style of composition in which Reale adds little that I can hear to what Shostakovich, Hindemith, Barber and Copland (references which all come to mind) have already said. Also, I’ve got to say that after repeated hearings, Reale’s alternation of tension and repose still sounds to me like proceeding by spurts: the tension is rarely sustained over a long span, it seems to peter out before it can truly take off. And finally, as is often the case in contemporary music which quotes music from the past, I find that the Brahms reference in the finale (at 1:04) comes rather like an embarrassment, sounding like a misplaced object (and evocative of Michel Legrand’s film music as much as of Brahms) in a vocabulary in which it doesn’t fit well. Reale doesn’t explain the title of his piece “Salon Music” – it must be ironic, if by that one expects music of a fluffly and superficial nature. Running almost 9 minutes, it’s a “big”, serious piece in the form of a theme and variations. It teems with ideas but I find it difficult to grasp its coherence and focus, and again I get this impression of music proceeding by spurts. In contrast, I find that there is more genuine, attention-holding pianistic invention in Larry Lipkis’ five short “Scaramouche variations”. Copland’s piano sonata or Albeniz’ Iberia (in the rhythmic contour of the “playful” second movement) sometimes come to mind, and these are not bad references either, if not an entirely cutting edge ones. I bought this disc for Bloch’s sonata, a piece not nearly often recorded as its worth would warrant. Some say that Bloch didn’t write idiomatically for the piano and that his compositional thought and textures were too orchestral. But why should a piano be like bare bones? His piano sonata sounds entirely idiomatically Blochian, with its rich textures and lush melismatas, its epic gestures and stark grandeur. You can hear therein, just as in his famous Schelomo, the imaginary sound-world of the Old Testament. 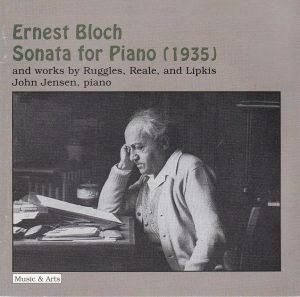 Certainly Bloch didn’t try and blot out the past, but he has found, without needing to quote any previous composer, what apparently eludes Reale in his own sonata: an entirely personal and original language within the confines of enlarged tonality, associated to a dramaturgy of tension and repose brought to breathtaking effectiveness. That said, when compared to the white-heat reading of Myron Silberstein on Connoisseur Society CD 4208 (barcode 762434420822 with works of Franck and Giannini), John Jensen appears to go for weight and power, but also to be excessively cautious in tempo in the “animato” sections of the first movement and in the finale, to the point of plodding; he also lacks nuance and hence atmosphere in the central “Pastorale” and his not helped either by the gruff sound of his piano. If it is the thinking and the music of Paul Reale that attracts you to this CD, it is self-commending. If, like me, it is mainly the music of Bloch you are interested in, the complete survey by Istvan Kassai on 2 Marco Polo discs remains indispensable to the Bloch devotee (vol. 1 8.223288 barcode 4891030232884, vol. 2 8.223289 barcode 4891030232891), while Margaret Fingerhut’s selection on Chandos CHAN 9887 (barcode 095115988725) can be an easier-to-find substitute. But, despite its motley couplings (Franck and Giannini), the Sonata by Silberstein is by far the best among those I have heard.